Master Ted Siders helping a student with his stance. Master Ted Siders showing students the proper stance for a position during their sequence. Students of Tae Kwon Do learn not only fighting skills, but also about what is right and what is wrong during their studies. 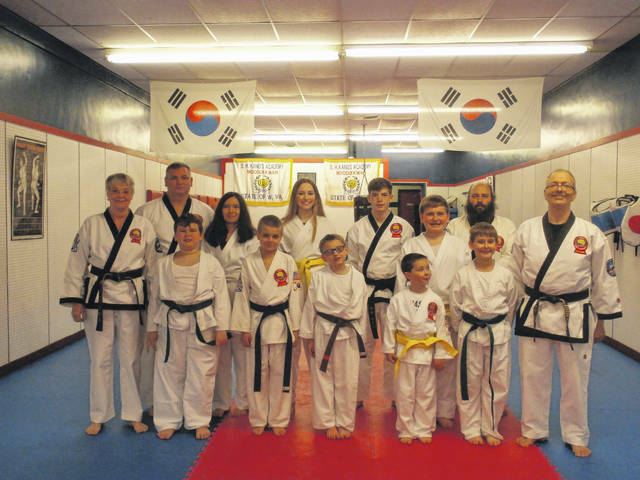 Those of Kang’s Tae Kwon Do Academy pictured are, in the back from left, Master Pam Siders, Frank Holcomb, Ellen Johnson, Ruth Carr, Bryce Holcomb, Luke Thomas, Matt Borghese, and Master Ted Siders, in the front from left, Eli Dore, Brody Profitt, Wyatt Shepard, Hunter Browning, and Raylon Shaffer. Master Ted Siders watches the students’ form and helps them perfect their stances. Frank Holcomb leading the younger students in a sequence. 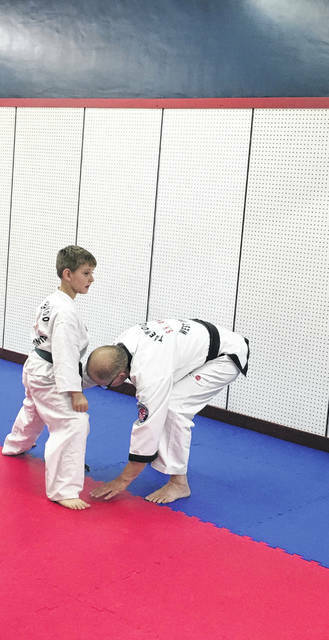 Master Ted Siders teaching his student Wyatt Shepard to stand strong and properly in his stance. The students moving to a different position during their sequence. Frank Holcomb helping a younger student with his stance. 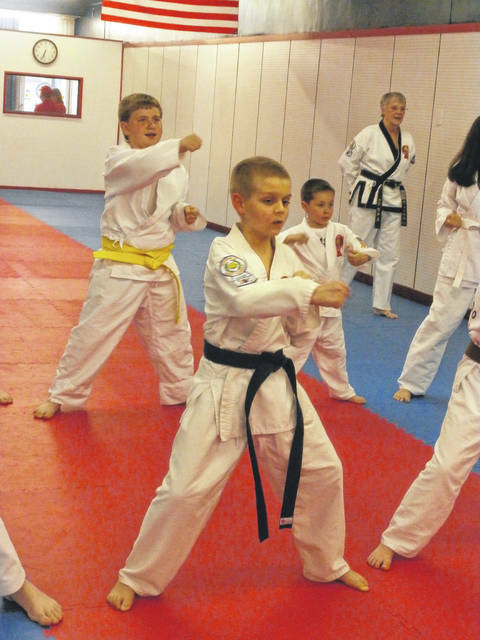 The students of Tae Kwon Do learn more than just a fighting skill, they learn how to be respectful. 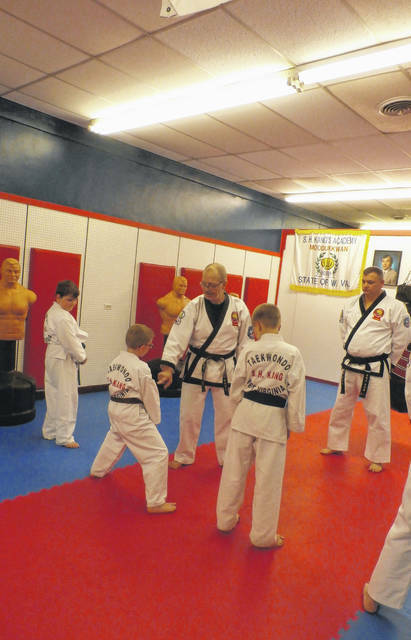 POINT PLEASANT — As a child, a local man would watch his favorite show featuring Bruce Lee and would wonder if he could ever study the art of Tae Kwon Do. In 1982, Ted Siders, along with his wife Pam, began their training in Tae Kwon Do. After rising in ranks through the years, the couple decided to teach their own class. 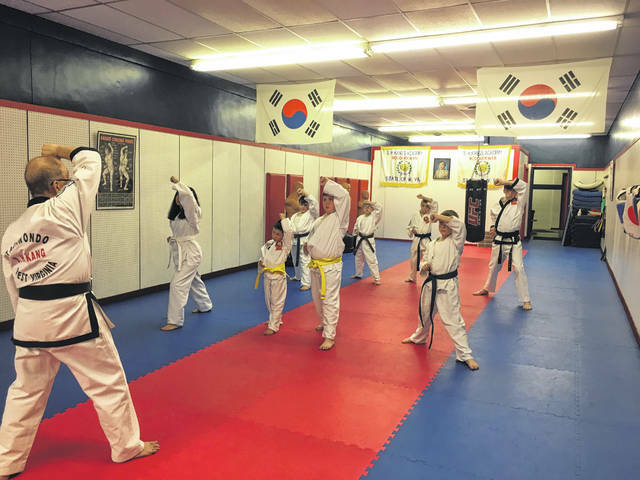 They first taught a class in Ashland, Ky., yet after a brief stint in that area, they started teaching classes at Kang’s Tae Kwon Do Academy on Main Street in Point Pleasant in 1989. Flash forward 30 years and Master Ted and Master Pam, who are in their sixth degree and are preparing to test for their seventh degree, are still teaching Tae Kwon Do at the academy. 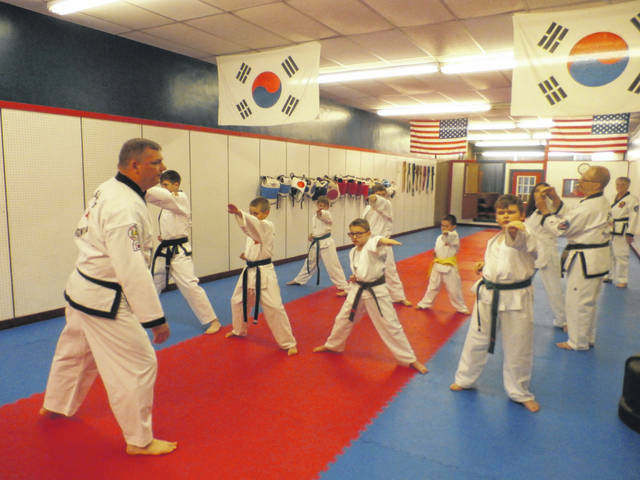 Pam shared currently they have 23 students practicing Tae Kwon Do, all of different skill sets and ranks. The academy is open Monday-Thursday from 6:30-7:30 p.m. and students can come in to train any of those days. Newcomers of any skill level may join and it is encouraged they set up an appointment with Ted and/or Pam before they begin their journey at the academy. Ted shared Tae Kwon Do is a creative martial arts practice and is the way of the hand and the foot. “Tae” means foot, “Kwon” means fist, and “Do” means way. Those who practice “destroy” with the hand and the fist and kicking is known as an art. Though he and his wife have been practicing Tae Kwon Do for 37 years, it is not for everyone as moving up to each rank can take years at a time between each. While practicing, a student should keep a bigger picture in perspective. 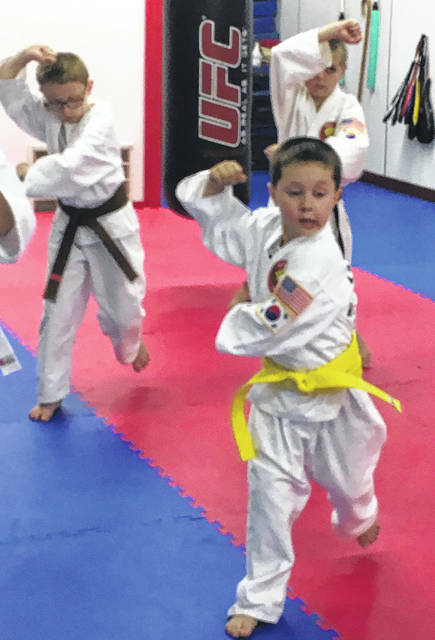 Ever since he was a child, Ted always wanted to train in Tae Kwon Do, yet never had an opportunity while growing up in Mason County. When he left the nest for some time, he was able to begin his training with his wife then was able to move back to his hometown where they could spread their knowledge. “If you make it a part of your life and everything it makes training a lot easier to do,” said Ted. At the moment, Ted and Pam have three instructors preparing to test into their fifth degree. Some students who train under the couple come in family duos such as Frank and Bryce Holcomb. Bryce has been training at the academy for four-and-a-half years and is a first degree black belt in the first gup and is nearing his second degree. 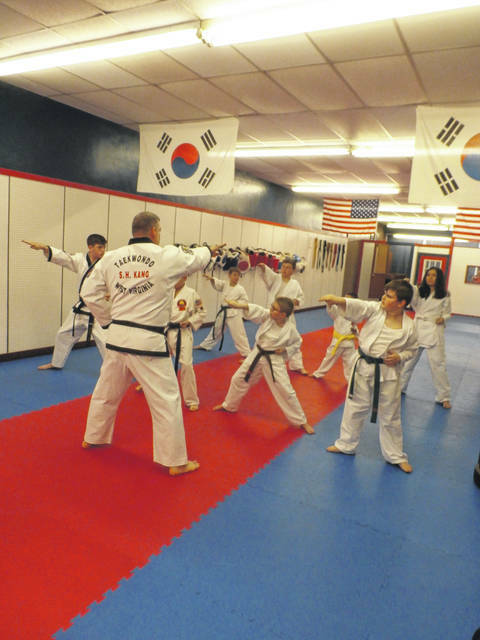 He shared he always thought it would be “cool” to try Tae Kwon Do out as his father practiced it when he was younger and thought it would be a good way to learn self-defense. Bryce plans to keep up with his practices and continue to achieve higher in rank while helping out the younger students and Ted and Pam. Frank, Bryce’s Father, followed suit and joined the academy after his son. Frank has been training at the academy for two-and-a-half years and has recently tested for his first degree black belt. Another father and son duo at the academy are Gilbert and Wyatt Shepard. Wyatt known as the “tiny tiger” in class shared he has been training for one year now. His father joined him not long after he joined and is quickly coming up in ranks with him. Wyatt’s goal for now is to become a first degree black belt. Matt Borghese has been training at the academy since 2000 and is in his second degree of training. When he first began, he had just finished horseshoeing school and needed a physical activity to help with flexibility and movement. One of his friends who had just started practicing martial arts recommended he join the academy. 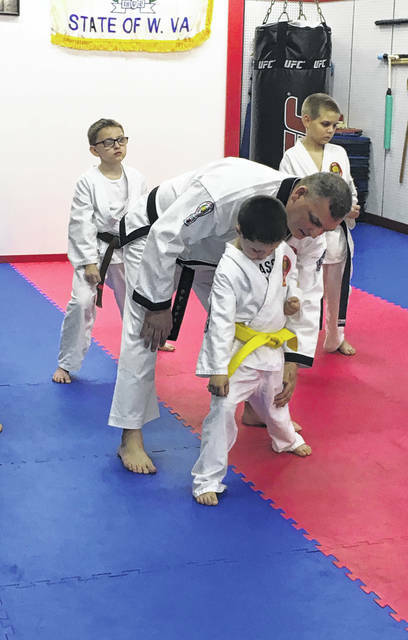 “At this point it’s just a way of life almost and with that what I do in Tae Kwon Do has changed where physically I am getting older,” said Borghese. When going through training at the academy, Ted shared he and Pam not only teach their students fighting skills, they teach them about what is right and what is wrong and how to be respectful. A natural maturity comes while practicing Tae Kwon Do. 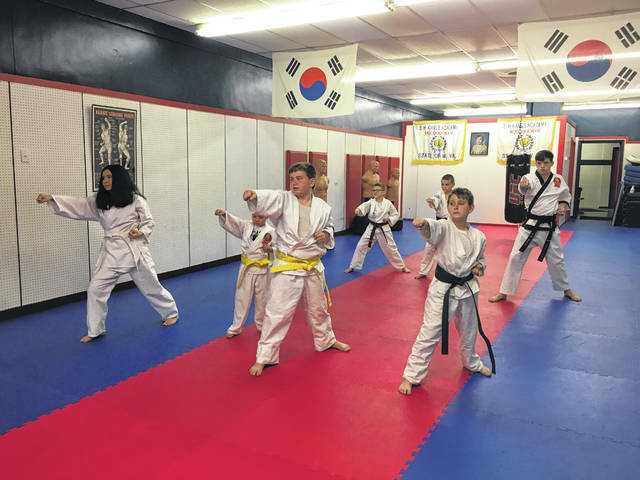 Those of Kang’s Tae Kwon Do Academy have been celebrating their 30th anniversary being a business on Main Street. For further questions or to learn more, individuals may call Ted or Pam at the academy at 304-675-2009.